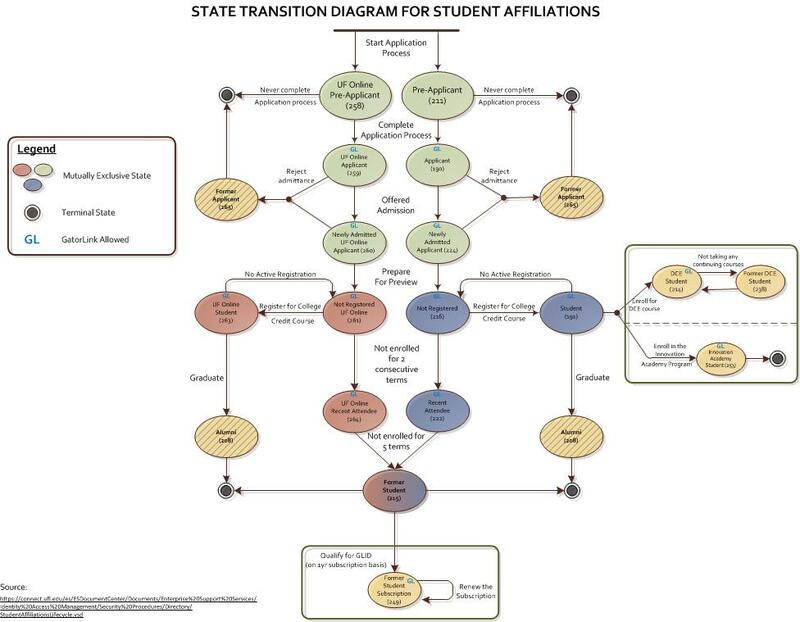 The state transition diagram shown above shows what all states a UF and UF Online Student goes through right from becoming a Pre-Applicant to an Alumni. 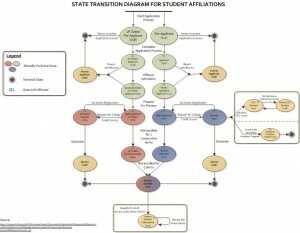 The ovals represent the student affiliations and the transactions are shown by the arrows. The events leading to the transactions are mentioned near all the arrows. The terminal state means the end of the state diagram or the life-cycle of a student. When a candidate starts the application process for admission into the University, he is in the state of a Pre-Applicant(211). If he completes the application process, he proceeds to the state of Applicant(190), otherwise, he comes to a terminal state. All the applicants who are offered admission come to a state of Newly Admitted Applicants(224). If they are rejected admittance, then they come to the terminal state. Newly Admitted Applicant then becomes a Non-Registered(216) student. If he then registers for college credit courses, he becomes a Student(191). A student can go back to being a non-registered student if there is no active registration for him. If a non-registered student is not currently enrolled in any course but was enrolled in last 2 to 5 terms then he is in the state of a Recent Attendee(222). A recent attendee becomes a Former Student(215) if he is not enrolled for more than 5 terms. A student can be a DCE Student(214) and an Innovation Academy Student(253) at the same time. As a student, he may or may not enroll for a continuing course or for the Innovation Academy Program. If a DCE Student is not taking any continuing courses then he becomes a Former DCE Student(238). Similarly, a Former Student(215) can have a Former Student Subscription(249) affiliation if he chooses to get the subscription for GLID. This subscription can be renewed after 1 year. University Registrar – Registered for any traditional UF college credit course regardless of the number of hours. Name and either SSN or Birth Date are required to declare a Student affiliation. University Registrar – Registered for any UF Online college credit course regardless of the number of hours. Name and either SSN or Birth Date are required to declare a Student affiliation. University Registrar / Distance, Continuing & Executive Education (DCE) – A student, credit or not credit, taking courses through DCE. Name is required; additional identification may be provided. University Registrar – Not registered traditional student. Name and either SSN or Birth Date are required. University Registrar – Not registered, degree-seeking UF Online student. Name and either SSN or Birth Date are required. University Registrar – A recently admitted traditional student who has yet to attend or register for courses at UF. Name and either SSN or Birth Date are required. University Registrar – Student in the Innovation Academy program for Spring/Summer on campus; fall off campus enrollment. Name, Date of Birth, SSN or Passport Number, and an Email is required for Identity management purposes. This affiliation may require special handling by some service providers at UF. An individual can be both a student and an Innovation Academy Student. University Registrar – A UF earned degree recipient. Name and either SSN or Birth Date are required. University Registrar – A person who has submitted an admission application to a traditional UF degree seeking program. Admissions – A person who has submitted an admission application to a UF Online degree-seeking program. University Registrar – Not registered student who has not been enrolled for 5 terms. Specific action must be taken prior to re-admission. Name and either SSN or Birth Date are required. A traditional student not currently enrolled, but was enrolled within the last 2 – 5 terms. A UF Online student not currently enrolled, but was enrolled within the last 2 – 5 terms. A student, credit or not credit, no longer taking continuing education courses at UF. A companion affiliation to (215) Former Student affiliation. It’s used to qualify the former student for a GLID on a one year subscription basis. Admissions – A traditional or UF Online student applicant that has been denied or a newly admitted applicant that has not matriculated. Admissions / Professional Colleges -A person who has begun the admission application process to a traditional UF program, but has not submitted an application. Examples of documents that may be used to begin the application process follow: application, transcript, financial aid application. Name is required; additional identification may be provided. Admissions /Colleges -A person who has begun the admission application process to a UF Online degree-seeking program, but has not submitted an application. Examples of documents that may be used to begin the application process follow: application, transcript, financial aid application. Name is required; additional identification may be provided.